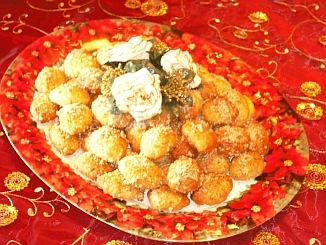 Well, it's Christmas time again, so we're posting recipes for traditional Greek Christmas sweets for you. Today it's Melomakarona, which is my particular favourite, and tomorrow I'll be posting the recipe for Kourambiedes. In between Christmas and New Year I'll post the recipe for Vassilopitta, which is the traditional New Year cake in Greece, with the good-luck charm or coin in it. First prepare the syrup and let it cool because you need the syrup to be cold and the melomakarona to be hot when you dip them in the syrup. Put all the syrup ingredients apart from the honey in a pan and bring to the boil for 2 minutes. Remove from the heat, add the honey and stir, then set aside to cool. In a shallow pan mix all the ingredients from the 1st mix. Mix them really well by hand, not by mixer. In a mixing bowl mix all the ingredients from the 2nd mix. Gradually add the ingredients from the 2nd mix into the pan with the 1st mix. Mix them by hand to make a dough, but it is very important not to handle this dough a lot because that will remove the oil from the mixture. Again handling the dough as little as possible, form them into small oval shapes (see photo) and put them on baking trays covered with greaseproof paper. Bake them one tray at a time in a preheated oven at 180 degrees Celsius for 30 minutes. As soon as you remove them from the oven, dip them carefully – a few at a time - in the pan with the cold syrup. Leave them in there for about 1 minute, making sure they are fully immersed in the syrup. Remove and place on a tray and repeat with the other melomakarona while they are still hot. Repeat the same process with the other baking trays. Finally, pour the thyme honey over the melomakarona and then sprinkle the grated walnuts on top. Let them cool and place them on your decorated dishes or in a plastic container, but not in the fridge. They keep for at least a week. I love melomakarona. I really can eat a whole plate full lol, along with korabiethes hehe.